July is upon us, and I thought this would be the perfect time to try something a little bit different for me. 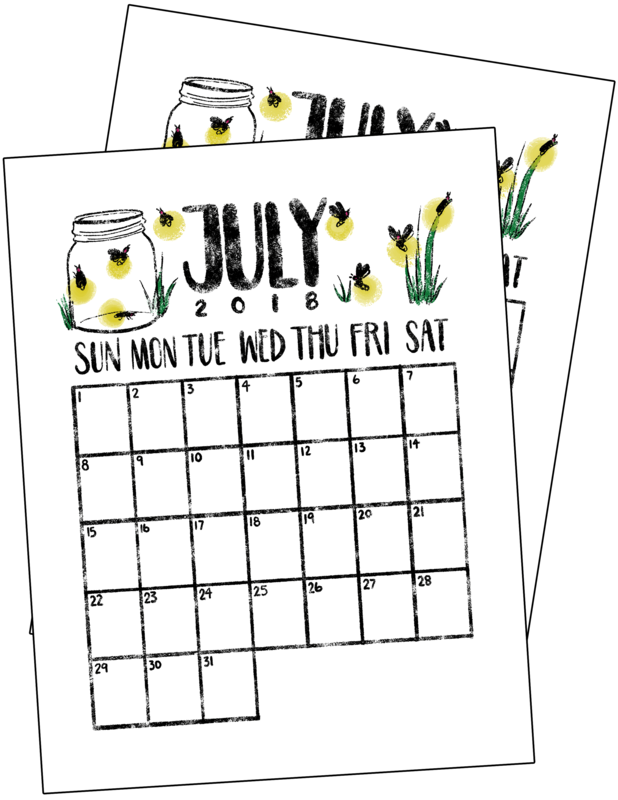 I’ve had plenty of free bullet journal and planner printables available in the Fox Den for a while, but I decided to try and add a monthly bullet journal calendar printable each and every month starting now! Generally speaking, I’m shy about committing to such a long-term project. But ever since I got my new Wacom tablet, I feel like this is something that I can accomplish. 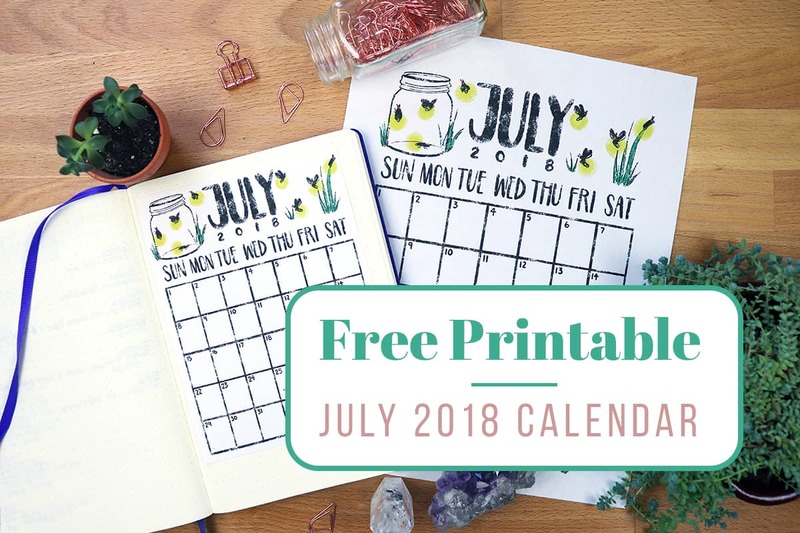 So without further ado, let’s jump into this free July 2018 calendar printable! For me, there’s nothing that evokes feelings of summer’s freedom and relaxation as much as the warm glow of fireflies. I grew up with their glow lighting up the purple dusk as a long summer day rolled into night. I, like many other kids, used to try to capture their glow in my hands and collect them into mason jars. It was my best attempt at bottling that summer magic. 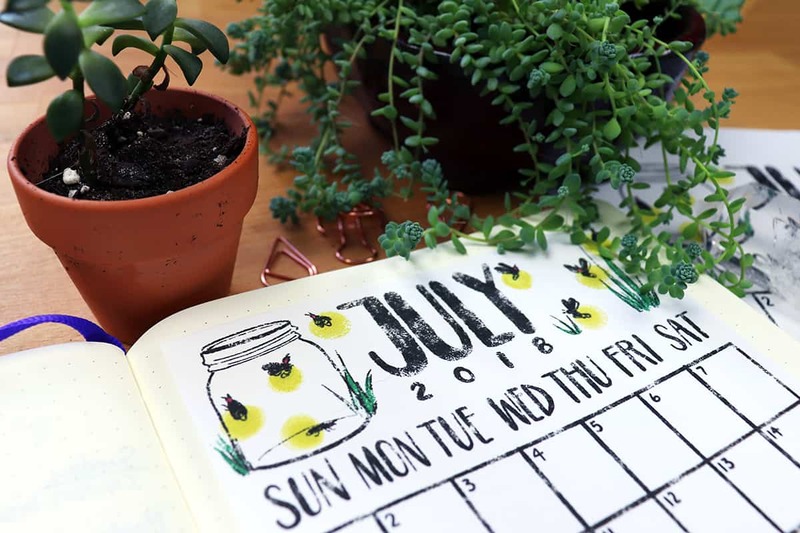 That’s why I decided to design the July bullet journal monthly calendar with fireflies! I wanted to try and encapsulate the pure magic that is this time of year in this monthly printable. Seeing the fireflies coming out at night makes me feel nostalgic, wistful, and happy, and I want to pass those feelings on to you as you set up and use your bullet journal spread. In fact, I am so in love with fireflies right now that I even incorporated them into my July setup in my watercolor planner! For this monthly bullet journal printable, I thought I’d give you a bit more in the way of printing options than usual. In fact, this printable has the most options than any printable I’ve ever created! First of all, I decided to actually create a monthly bullet journal printable with color. Yup, you heard me right! Up until this point, all my bullet journal printables have been strictly black and white. I don’t know why I wanted to keep it so restricted, but whatever fears held me back will hold me back no longer! For all the folks who crave color, I’ve got you covered. That being said, I’m also creating a black and white printable option for people who aren’t interested in using their color ink cartridges! I get it — ink is crazy expensive. So if you’re looking to keep it simple, I also have some black and white printable versions for you. If you still want to add color in your bullet journal, then you can treat this printable like a coloring book and use your favorite pens to add your own pizazz. And last but not least, I am also giving you the option to grab this monthly bullet journal printable in the standard letter size (8.5″ x 11″) and in A5 (5.8″ x 8.3″). So whether your planner is a binder or you use a more common A5 notebook, you are covered in the printable department! Oh, and there’s a black and white version and color version in both print sizes for optimal bullet journal customization. I told you — I got you covered! Ready to download this free monthly planner printable? All you gotta do is sign up to the Fox Den Resource Library! It’s totally free, and it comes with plenty more freebies. Plus there will be more of these monthly calendar printables coming, so you have more free content headed your way! Click here to sign up if you aren’t already and get access ASAP. If you are already in the Fox Den, then all you gotta do is head here or click the image below to get to the sign in page. Enter the password that was sent to your email when you signed up and this monthly bullet journal printable is all yours! Now let’s rock July, shall we?